This is the exclusive VMC accredited training program running in the Australia and New Zealand region, and will provide trainees with an established method for facilitating rhythmic musical events that is used by thousands of professionals worldwide. This is the method pioneered by Arthur Hull (link https://villagemusiccircles.com/about-vmc/about-arthur-hull/), father of the modern community drum-circle movement and has a strong philosophy of inclusion and empowerment. Ryhythm2Recovery are pleased to announce these dates and are excited that the Training Camp will be held at the beautiful Byron Bay hinterland at the Paradise One Retreat, Coorabell, NSW, which we are providing great rates and a choice accommodation options. 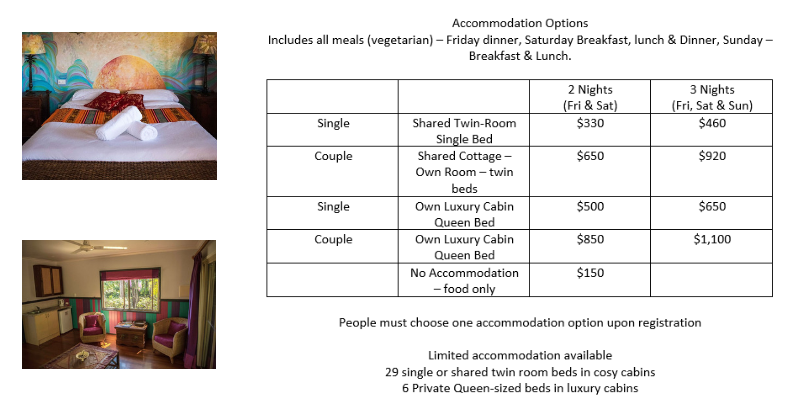 Your accommodation includes all meals (Vegetarian). - Request an invoice during the registration process. The confirmation email will contain a link that contains your invoice. This will include details on how you can transfer funds via Electronic Bank Transfer. - During the registration process, you can pay via Credit Card through PayPal. This payment method incurs further PayPal Charges. An additional cost of 2.6% will be charged (PayPal fees). Click on Pay Online (Paypal) then click on the FINISH button to continue to the payment session. Written requests for refunds must be emailed 21 days prior to the workshop commencement date and will be refunded (less $86.60 processing fee). Cancellations received within 21 days of the workshop commencement date will not be refunded. Late withdrawals may obtain a credit for a future workshop. No refunds are given for a non-attendance without notice. In the event of unforeseen circumstances, Rhythm2Recovery reserves the right to change or cancel training events.